Bostjan Nachbar, Gigi Datome, and Kyle Hines talked about the EuroLeague Players Association. BELGRADE – – The Independent EuroLeague Players Association was officially presented today in the press conference of Stark Arena Belgrade, where the Final Four is held. 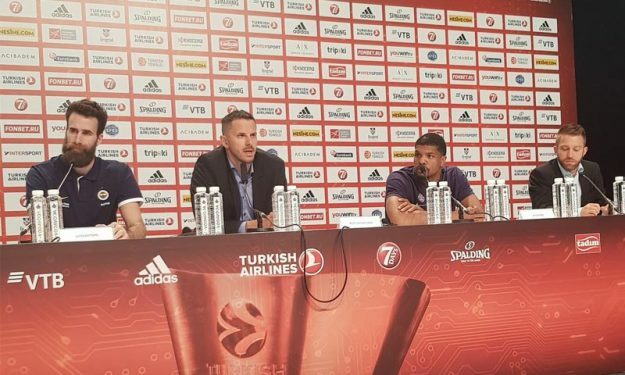 Former EuroLeague and NBA player Bostjan Nachbar, who took the initiative for the founding of the Association, spoke together with Fenerbahce forward Gigi Datome and CSKA Moscow Kyle Hines. “Over the last six months, I’ve done extensive work in traveling and trying to connect all the players. To see if there is such desire by the players to get connected and organized in such an organization. The desire is there. The players have expressed a big wish to be united and to create a platform that will unite their voice,” Nachbar said. “I want to stress the importance of our main goal. That this an association that will be led by the players. They will determine the course and who will be the president,” he added. “I felt that we want such an organization during the Windows of FIBA. As a EuroLeague player, I couldn’t join my national team and I couldn’t even say what was my opinion. That’s when I felt that there should be a common voice to express our point of view,” Datome added when asked if there was a specific moment when he felt that such an association is needed. During the 2018 EuroLeague Final Four in Belgrade, Serbia a historical moment occurred for the players in the competition. Former EuroLeague player Bostjan Nachbar along with active players Luigi Datome of Fenerbahce Dogus Istanbul and Kyle Hines of CSKA Moscow announced the upcoming founding of the Independent EuroLeague Players Association (ELPA). ELPA will be the union of basketball players competing in the EuroLeague competition. ELPA will aim to assist, represent and unite the players in achieving their goals, on and off the court. Following numerous extensive discussion with players of all 16 players, who have been visited by Bostjan Nachbar throughout the 2017-2018 season, ELPA will be officially founded at a players’ representative meeting held immediately after the end of the current club season. The players expressed their strong support for the establishment of this very important entity, which seeks to represent the players’ unified voice regarding Europe’s top club competition. All necessary organizational, legal and financial steps toward the founding have been made, including the presentation of ELPA to EuroLeague Basketball management that has encouraged the players to continue making progress in what has been deemed a priority for EuroLeague clubs. ELPA’s specific intention is to defend and pursue the rights of professional basketball players in the EuroLeague. Through collective bargaining with EuroLeague Basketball and the EuroLeague clubs, ELPA will seek to achieve a higher level of protection of players’ individual and collective rights and to improve the working conditions, economic benefits, and job security for all its members. Furthermore, ELPA will engage in organizational, financial, educational and marketing activities which will advance the economic stability and security of its members. Through charity and personal development programs, ELPA will strive to connect its members with the wider community.